Blog / Malta & Gozo / When is the best time to visit Malta? As an islander you get asked this question often, when is the best time to visit Malta and the answer is, all year around. The second answer is that the best time to visit Malta depends on what it is you are looking for in a holiday. There are so many reasons to visit Malta, that the best time to visit Malta is going to be explained below according to the type of holiday you choose to invest in. However, first and foremost Malta is a good weather destination all year around. Although debatable, we strongly agree the high season happens between June and end of September. Starting after Easter, the archipielago comes back to life, and the best time to visit Malta starts for the hot summer day lovers. It is also from then onwards until the end of October that we have pretty much uninterrupted blue skies every day. All the resorts open back up and the diving schools, as well as the outdoor adventure sports season, start again. With weather like this, it is easy to choose to want to stay outdoors most of the time, apart from lying on the beach and soaking up those adored sun rays. 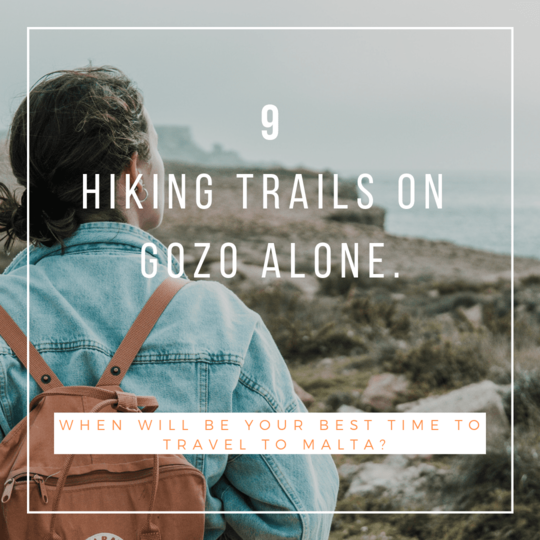 Best time to visit Malta or Gozo and hike or sea kayak. Especially at the end of May and beginning of June as well as during September, you will find the temperature ideal for kayaking, abseiling and hiking. The sun then is hot, but not scorching hot yet like in mid-July to end of August and wind is mostly not present and gentle at best. This makes for perfect conditions for walking along the cliffs on the many hiking trails Gozo has to offer for instance. If you leave early in the morning and are done with your daily trail by just after lunch, you are set to go and spend the rest of the day lounging on a beach knowing you have had an accomplished day. All trails on Gozo are well signposted and the Gozo tourism office can provide you with walking guides. You could even make a holiday of walking around Gozo once! Another option can be to circle the island once with a kayak, as there are several spots around Gozo, from where to depart and depending on the wind and the waves, you could potentially circle the entire island in a few days with your tour guide. Divers’ paradise - all year around. It doesn’t matter if you are an avid diver or just starting, in Malta and Gozo, you find so many diving schools you will be spoiled for choice. Of course in the high season, you want to ensure you are quick to book, as spots fill up and many groups tend to book in advance. A little out of the high season and in the mid and low seasons, since water temperature can still be 15 degrees Celsius in the low season, and is manageable with a body glove, this is an activity that can be pursued year around. There isn’t a best time to visit Malta, the question is, what do you fancy getting up to when here? Beach bumming and the usual summer shenanigans. If it is sun and beach that tickle your fancy and building sand castles with your kids on Ramla Beach and you don’t mind the islands being more populous in the high season, then you must come in June, July and August. One could posit, these are the months when things are really happening, meaning, everybody is out there and soaking up the rays, the resorts are full of people and there is a vibrant atmosphere with frequent local festas (local festivities, one for each municipality every week all over Malta and Gozo). If you love this buzz, this is your best time to visit Malta. The only thing to bear in mind then is, that the ferry queue over to Gozo is longer and you may have to wait a little bit longer to get onto local transport. All in all, however, to get that beach glimpse and fun atmosphere, this will be your best time to travel to Malta. If you rather find beaches less visited and some deserted, it may be worthwhile visiting outside the high season, in mid and low season. Depending on the day and the wind, you might then have to consult a wind forecast site online, as the wind might be a little stronger, but the sun will still be out with little to no clouds and overall it will be more than pleasant. 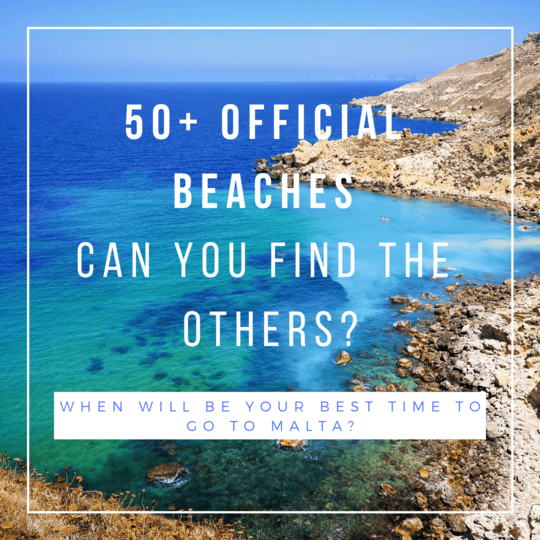 For the secluded beach bums, your time will be from as early as the end of March until mid-May and from mid-September until the end of October. I still swam in the sea on the 1st of November last year. In that case, when you get out you might have to quickly dry off and change back into your clothes, but it is doable, especially on a moderately windy day. The same goes for hiking and the other aforementioned action sports by the way. As long as you check the winds you are on the safe side, especially when cliff hiking. Best time to visit Malta for History & Culture. Few know that Malta is if not one of the first ever countries to become Christian and later roman catholic. More known is the fact that what gave Malta its grandeur was the gift in disguise given to the Knights of the cross of Saint John of Jerusalem in 1523, when they were, - we can say -, forced to settle, from Rhodes in Malta. The sultan of Egypt is the instigator, as he drove them out first from Jerusalem, in 1291 and later again from the Greek island of Rhodes in 1523. 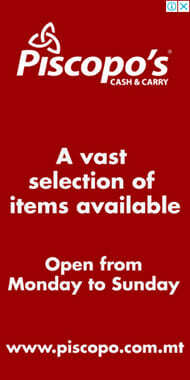 This goes to say, that Malta, for those interested in History, has evidently much to offer its visitor. So if it is History, more than landscapes, sports and beaches that you enjoy the most, chose a mid-season stay or even low season one, as visiting the museums and 4 UNESCO archaeological sites will be more pleasant, since temperatures are lower and there might be some intermittent cloudy days interspersed with occasional sudden downpours and wind. But, if equipped, this should not be a true impediment since your focus is catching up on History and Culture. Did you know there were people already living on the Maltese islands more than 5000 years ago? So, that might be an incentive for you, as this phase is not just interesting, but also worthwhile finding out more about. 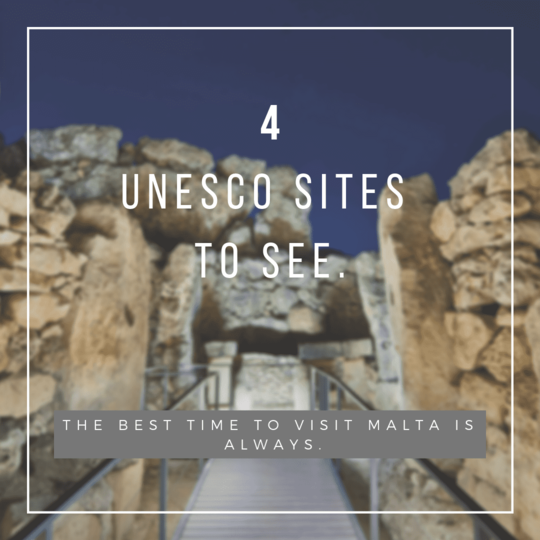 I’ll provide an example, The Ggantija Temples are the oldest, free-standing monuments in the world and are a testament to the Island's inhabitation for at least 1,000 years before the famous Egyptian pyramids of Giza were constructed. Do you like visiting Churches? 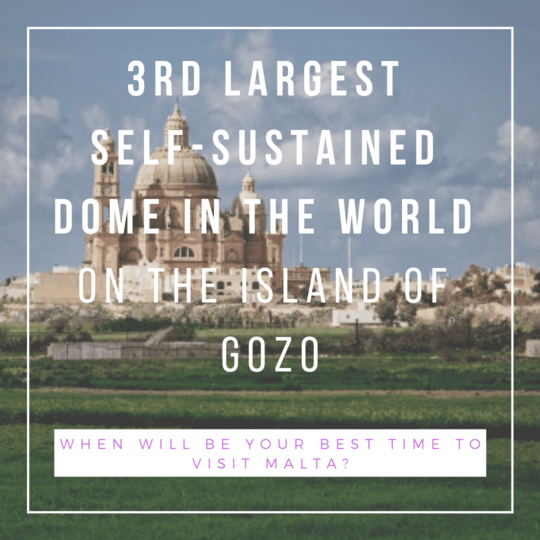 Another noteworthy result, for the History buffs out there, is that in the tiny village of Xewkija, on Gozo, you find the world’s third-largest self-sustained dome church. Third after nonetheless, Saint Paul’s Cathedral in Rome. A church entirely constructed and founded by the inhabitants of Xewkija themselves. Local population you may ask. Guess? 3.300 (source census: 2014). Amazing right? 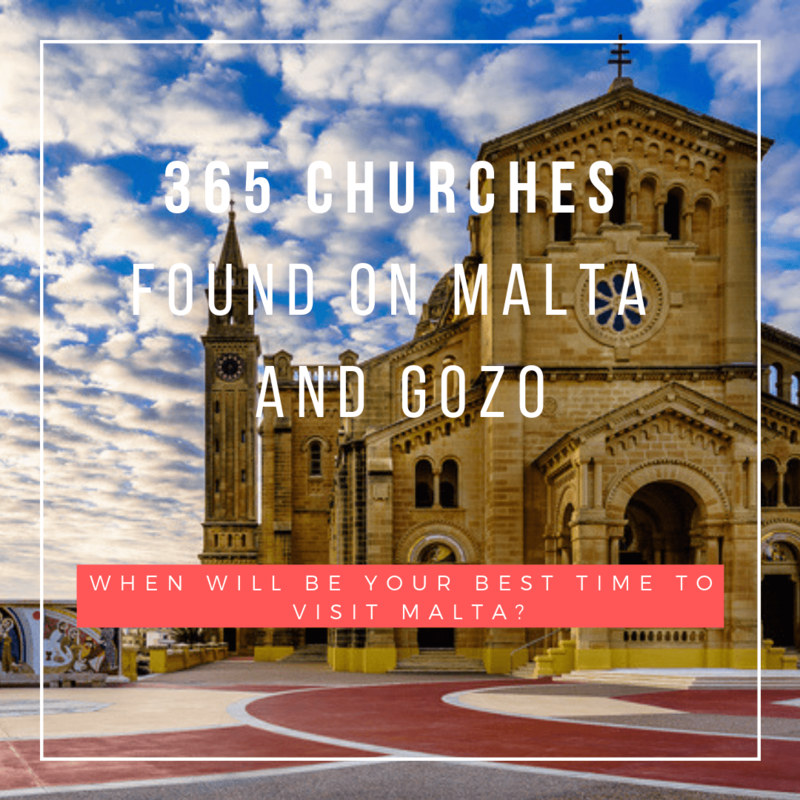 Oh and another amazing thing, if you are a church and architecture lover, is that according to legend, there is one church, cathedral or chapel for each day in the year on Malta and Gozo. If you plan on combining a religious festivity, like for instance Easter, you won’t be disappointed. The churches are lavishly decorated and every local municipality holds its own Good Friday procession where each Bible character is represented and church bells are heard across the island on Easter Sunday in unison. Did I mentioned before, we have more than 300 days of sunshine a year? Or should I say more than 300 enticing ultra-romantic sunsets a year? 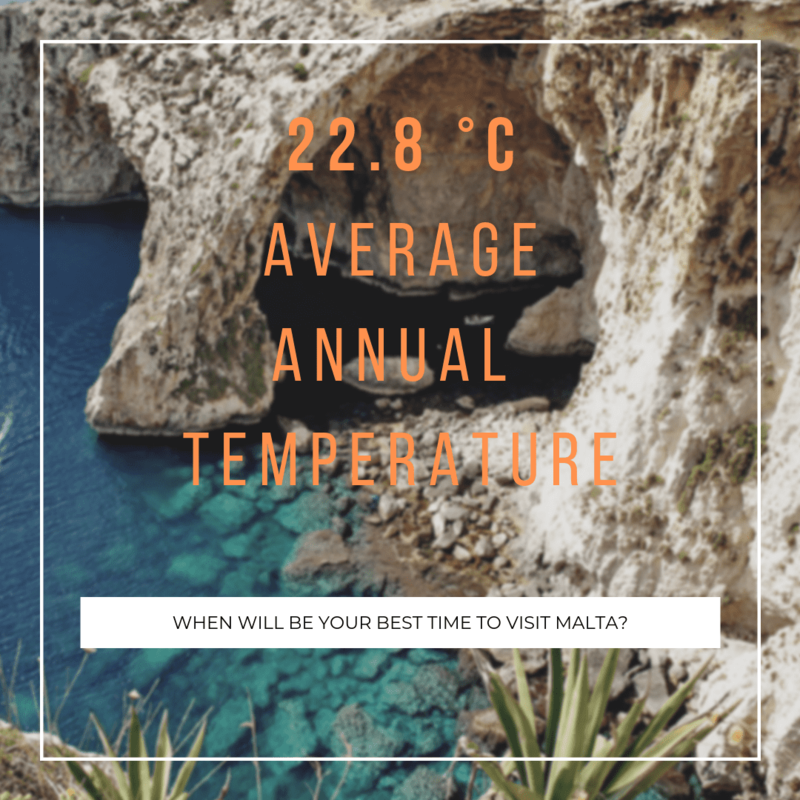 This little rainfall infographic might add to the desire to chose your best time to go to Malta this year. Mid of December and through until mid-February, you are likely to find most rainy and overcast days. The islands and especially Gozo are quite deserted. It does confer the islands a magical touch and invites the visitor to go inwards and reflect. If you are a writer looking for inspiration and need a cut from the routine of your usual surroundings back home, your best time to visit Malta might just be this one then. Rents are low and there will be little to no distraction. I’d say perfect writing weather. All in all like, I said at the start of this article. Your best time to visit Malta, is always! It just depends on what it is you want to do here on the islands. We hope you got some ideas and will choose our lovely home, as your next destination. “Mela”, as we say in Maltese, now go and book your ticket please and choose your best time to go to Malta, fast! You won’t regret it.